There has been a lot of buzz lately about the benefits and practicality of hammock camping. As with anything, there are advantages and disadvantages. But the hammock following is growing fast. As long as there are sizable trees capable of supporting the weight of a hammock, you’ve got a campsite. Today, we’ll be putting Eagles Nest Outfitters’ SingleNest Hammock to the test. ENO’s SingleNest Hammock is available in a wide-variety of color options including: Black/Yellow, Emerald/Khaki, Forest/Charcoal, Khaki/Black, Khaki/Maroon, Khaki/Olive, Navy/Blue, Navy/Forest, Navy/Olive, Navy/Yellow, Orange/Grey, Powder Blue/Blue, Purple/Forest, Purple/Fuchsia, Purple/Teal, Rasta, Red/Charcoal and Royal/Charcoal. The SingleNest is constructed from a breathable mildew resistant 70D woven nylon Taffeta high-tenacity fabric that has been UV treated for increased longevity. The durable triple-interlocking nylon stitching, nautical grade hanging line and lightweight aluminum wiregate carabiners are capable of supporting up to 400 pounds. The SingleNest has also been endorsed by the Boy Scouts of America. The SingleNest is large enough to fit an average-sized adult comfortably at 9′ 4″ long and 4′ 7″ wide. However, anyone requiring more room can opt for ENO’s DoubleNest which is 2′ wider than the SingleNest. If you need even more room, ENO’s DoubleDeluxe is 2′ wider than the DoubleNest. At a little less than 16 ounces and approximately 4″ in diameter, the SingleNest is certainly compact and lightweight enough to stow easily in a small backpack with the rest of your gear. The DoubleNest weighs 19 ounces and the DoubleDeluxe weighs 26 ounces. The SingleNest is easy to setup and teardown. It can be deployed and put away in only a few minutes time. It folds down easily into a compact softball-sized ball and stores inside the integrated stuff-sack providing ample protection from the elements when not in use, while doubling as a convenient pocket or cup holder when the hammock is deployed. The easiest and least intrusive way to setup and teardown a SingleNest hammock is to use one of ENO’s excellent strap systems (sold separately). Each of their strap systems are approximately 9′ in length, support up to 400 pounds, and cost less than $30 for the pair. 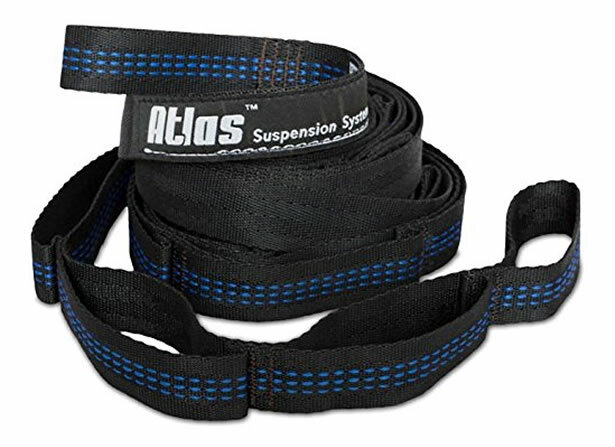 The Atlas Suspension System is constructed from 1″ PolyFilament Webbing providing 30 adjustments points and can easily be daisy chained together. But the pair does weigh a total of 11 ounces. The SlapStrap Pro Suspension System on the other hand is made from 3/4″ Tubular Nylon Webbing providing only 8 adjustment points. However, this system is a little lighter at 9 ounces for the pair. 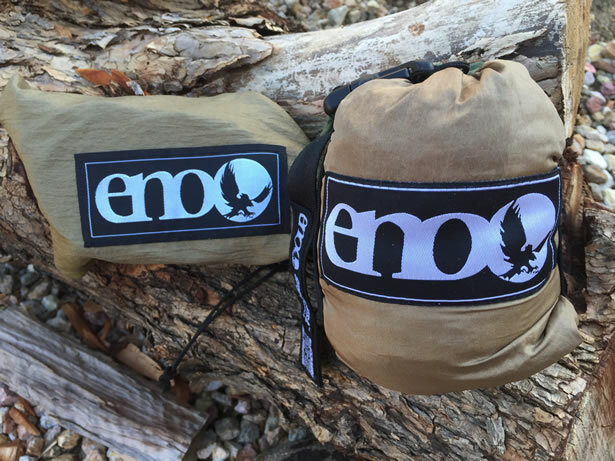 There is no need to learn special knots or damage tree bark with either of ENO’s strap systems. Simply wrap each one around a tree and loop it through the end, then hook one of the sturdy carabiners provided with each of their hammocks through one of the adjustment loop points at the other end of the strap. For the most comfort the hammock should be at chair height with each of the two straps set at a 30° angle. 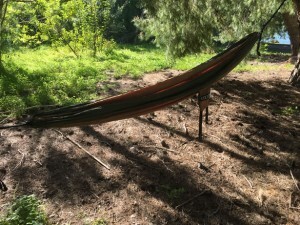 For backyard use, a SingleNest will work with various hammock frames as long as the frame will fit a 9′ 4″ hammock. For safety sake, do not exceed the maximum weight of 400 lbs. and do not hang the SingleNest more than 18 inches above the ground. Additionally, the surface area beneath your hammock should be free of rocks and sharp objects just incase. ENO recommends either machine washing your hammock in a front loading washer or hand washing their hammocks with cold water and a mild detergent or a gear wash. But don’t forget to remove the carabiners first. Also, do not put these hammocks in the dryer. Always hang them up or lay them flat to air dry. To avoid that nasty mildew smell, avoid putting them away damp or wet. Let them dry thoroughly first. Always check your gear before each use to ensure that it is in good working order. UV damage will cause your hammock’s color to fade and become brittle which can lead to tearing. Avoid leaving your hammock out year round. The best way to store and protect your hammock is in the attached compression stuff sack, keeping it in a cool, dry space when not in use. ENO warrants their products to be free from manufacturing defects for a period of 2 years from the original date of purchase as noted in more detail on ENO’s warranty page. Always be aware that sharp objects will wreak havoc on your hammock. However, should any small holes and tears appear, there are hammock repair kits available. To test the functionality of the SingleNest, I decided that I would set it up and tear it down as many times as I could in 10 minutes. Once I reached a site where I wanted to set up camp, pulled out the stuff sack from my pack and started the clock. I was able to set the Atlas suspension straps and deploy the hammock in less than 3 minutes, and tearing it all down was even faster. After a few attempts, I found that I could deploy and tear it down nearly 2-1/2 times in the 10 minutes that I gave myself. Setting up and tearing down camp can’t get much better than that. Additionally, I thought that I would try to get some sleep in the SingleNest… Really that is the most important part of the challenge, right? When you hop into the SingleNest and lay down along the center, the hammock immediately wraps around you rather snuggly. Some might find this feeling a little claustrophobic at times. Hammock are typically less stable with all of the weight down the center and can cause excessive discomfort in your legs. Therefore, it is best to lay at an angle with your head on one side and feet on the other allowing the hammock to stabilize and the bottom to flatten out making it much more comfortable to sleep in. I am not a huge guy, but at 250 lbs I found that I just could not get comfortable enough in the SingleNest. I found that I could not get angled enough across the hammock to make a big difference. In my case a DoubleNest would fit me much better. I found that my Atlas suspension straps fit nicely in the stuff sack with the hammock so everything I need is together in one small pack. All together the SingleNest and straps weigh a little less than 26 ounces. Not too bad when you consider it is a complete bedding system. 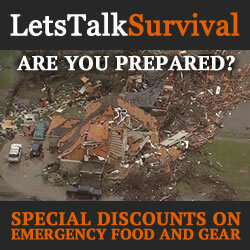 However, in cold or wet weather bringing along a tarp and underquilt would likely be imperative. One of the greatest advantages to sleeping off the ground in a hammock is the simplicity in finding a good campsite. No need to search for large flat areas free of rocks and debri. 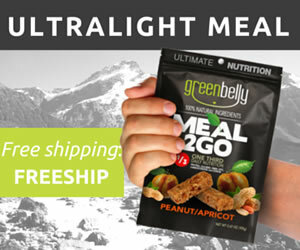 They are very comfortable and perfect for eco-friendly “Leave No Trace” camping. The SingleNest is a perfect option for any campsite, walkabout or bug-out scenario where there are trees around. Just find two trees or posts anywhere from 10′ to 20′ apart and you are good to go. The Nylon Taffeta fabric is very breathable, therefore it does not insulate very well. As a result, sleeping above the ground without some kind of reflective mat or underquilt, and maybe even a topquilt would simply be nuts in cold weather. Additionally, there are many other options available for stowing gear up off of the ground, tarps for keeping the elements away, and of course bug nets for keeping those nasty little pests at bay. Hammock camping is not for everyone, and sometimes sleeping on the ground just makes more sense. However, if hammock camping does work for you, ENO’s SingleNest and a pair of their rugged support straps are very hard to beat. Its simplistic design and high-quality materials yield an outstanding compact, lightweight, and most of all durable product. ENO got a lot of things right with this one… I give ENO’s SingleNest and the Atlas Straps two thumbs up and recommend that you consider a set for yourself.